Before his work on Lord of the Rings, Peter Jackson was more famous for his horror-comedies than he was for his dalliances with elves and hobbits. After the success of the more dramatic Heavenly Creatures, Jackson made The Frighteners, a wickedly inventive, amusing and macabre story of ghosts, serial killers and moving on. The film stars Michael J. Fox as Frank Bannister who developed the ability to see and talk to ghosts following a tragic car accident that killed his wife. Using his abilities to stage hauntings with three ghosts, Cyrus (a 70s gangster), Stuart (a '50s nerd) and The Judge (an Old West gunslinger), Frank soon finds himself investigating a spate of deaths in the city after it becomes clear that a serial killer has returned from the grave to take up his spree again. Supernatural comedies can often fall quite flat (the recent Dark Shadows for example), but at its best it can produce much beloved films like Beetlejuice and Ghostbusters. 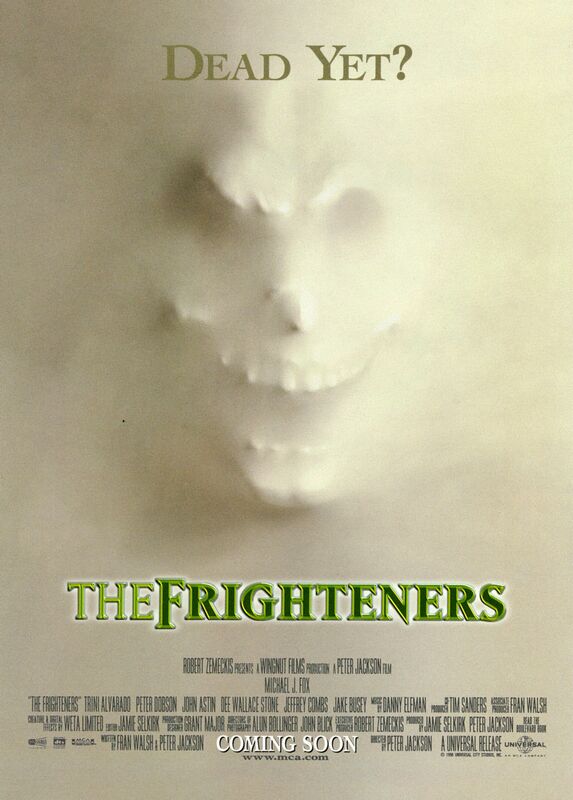 The Frighteners may not have been the biggest box office success when it was released, but it has gone on to develop its own following and is one of those films that I have often been told to see. Thankfully, it didn't disappoint and was exactly the kind of tonic needed after the fairly dreary double bill of White Zombie and The Innkeepers. One of the main criticisms that was levelled against The Frighteners on its release was that it was a tad overcrowded, but it's something I found actually worked in the film's favour. For me, it suggested a more complete and, oddly for a supernatural film, organic world with its own rules and regulations. Some you were told along the way, others you had to pick up yourself. The cemetery scenes are a perfect example of this; there are whole colonies of ghosts with their own little stories that you get to see glimpses of. R. Lee Ermey as Sergeant Hiles is a masterstroke that provides a great foil for the sardonic Frank and also drops in little bits of information about what ghosts can get up to in their respective afterlives. He never stops being a soldier and uses that to his advantage. For a film made 18 years ago, the effects are still surprisingly solid, particularly the wallpaper stretching appearances of the 'Grim Reaper' in the film's opening thrilling sequence. Likewise, the ghosts themselves still work well within the context of the film and the attention to detail is really quite special, adding a little touch here and there to develop the characters. The Judge is a particular stand out, hardly surprising that it was effects maestro himself Rick Baker who designed his look which was then applied by Brian Penikas. All credit too must go to Fox for handling the physical aspects of interacting with the ghosts and the pratfalls that came with it. His performance here as the misanthropic Frank is excellent and his journey from grief to finally being able to move on from his wife's death is nicely observed, if a little crowded out by excessive ghost-chasing. Trini Alvarado's Lucy brings a light comedic touch to the proceedings and works well alongside for Frank, even if she does get over the death of her husband ridiculously quickly. It helps too that their antagonists are worthy opponents; Jake Busey gives good psycho once again as the murderous Johnny Bartlett whilst Jeffrey Combs' Special Agent Milton Dammers gets all the best lines: "You are violating my territorial bubble." The Frighteners may be a little madcap and busy, but it's highly entertaining too and one that I'll be sure to revisit in the future. You can check out the full list of Shocktober reviews so far here.